Welcome to my patisserie challenge. This year I have decided to buy something different from our village boulangerie every Sunday and to enjoy the simple pleasure of treating myself each week. Today is International Women’s Day, so I decided my choice of sweet treat should be something beautiful and delicate, yet bold and able to hold it’s own in the world of patisseries. 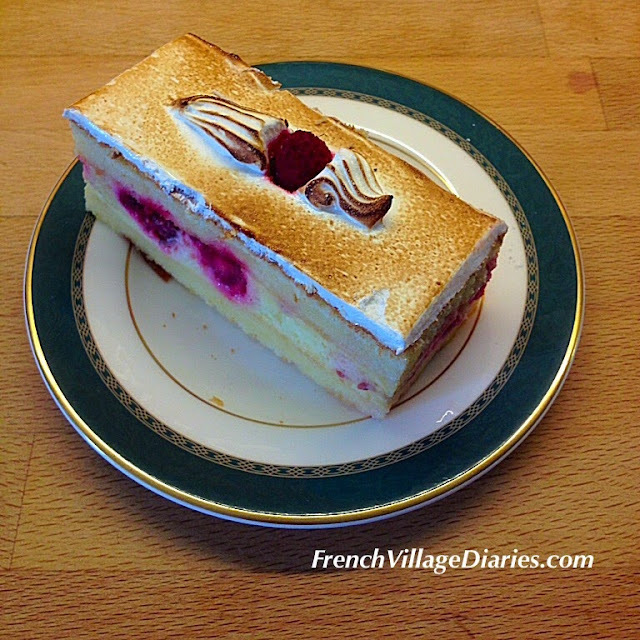 I give you the capitole framboise (raspberry cake), a sweet, soft and moist delight of a dessert. It is made up of two sponge layers that are light and airy, sandwiched together with whipped cream and whole raspberries before being topped with flambéed meringue and decorated with a raspberry. I very much enjoyed this pleasing patisserie that is both sophisticated and decadent. It’s certainly not the sort of treat I would be happy sharing, but I’ll happily be buying it again. Bernadette at the boulangerie is certainly an inspirational woman for me. Don’t forget to join me again next week for another patisserie choice. This post is linked to the Dreaming of France weekly link up at Paulita's An Accidental Blog.